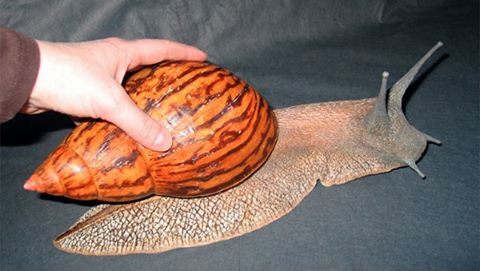 Achatina achatina are the largest air-breathing land snail in the world, , a terrestrial pulmonate gastropod mollusk in the family Achatinidae. The name 'Achatina' is from 'achates', Greek for agate.The shells of these snails often grow to a length of 18 centimetres (7.1 in) with a diameter of 9 centimetres (3.5 in). Certain examples have been surveyed in the wild at 30×15 cm, making them the largest extant land snail species known.The species is believed to be native to West Africa, within 100–190 miles of the coasts of Sierra Leone, Liberia, Ivory Coast, Togo, Benin, Ghana, and Nigeria.